During World War II federal officials located enemy prisoner of war (POW) camps in Oklahoma. They determined that the state met the basic requirements established by the Office of the Provost Marshal General, the U.S. Army agency responsible for the POW program. Guidelines mandated placing the compounds away from urban, industrial areas for security purposes, in regions with mild climate to minimize construction costs, and at sites where POWs could alleviate an anticipated farm labor shortage. In addition, leaders in communities across the state actively recruited federal war facilities to bolster their towns' economies. Members of chambers of commerce and local politicians lobbied representatives and senators to obtain appropriations for federal projects. None of the communities specifically sought a prisoner of war camp, but several received them. Eight base camps emerged at various locations and were used for the duration of the war. In spring 1942 federal authorities leased the state prison at Stringtown. Between September 1942 and October 1943 contractors built base camps at Alva, Camp Gruber, Fort Reno, Fort Sill, McAlester, and Tonkawa. In autumn 1944 officials obtained use of vacant dormitories built for employees of the Oklahoma Ordnance Works at Pryor. In August of that year a unique facility opened at Okmulgee when army officials designated Glennan General Hospital to treat prisoners of war and partially staffed it with captured enemy medical personnel. Workers erected base camps using standard plans prepared by the U.S. Army Corps of Engineers. Each compound contained barracks, latrines, and mess halls to accommodate up to one thousand men. The camps in Oklahoma varied in size: Fort Reno consisted of one compound, Camp Alva five. Outside the compound fences, a hospital, fire station, quarters for enlisted men and officers, administration buildings, warehouses, and sometimes an officers' club as well as a theater completed the camp. POWs received the same rations as U.S. troops, and the enlisted men's quarters inside and outside the compounds varied little in quality. Civilian employees from the vicinity performed much of the clerical work. By May 1943 prisoners of war began arriving. 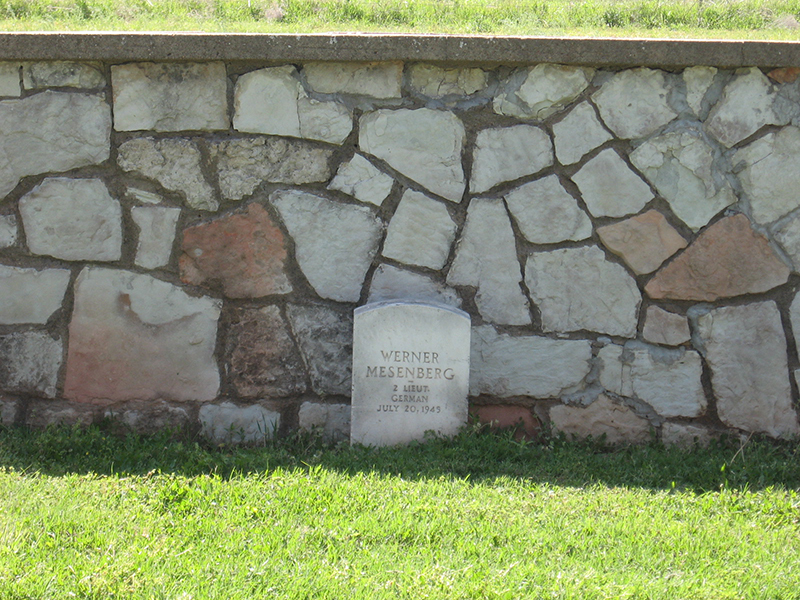 Throughout the war German soldiers comprised the vast majority of POWs confined in Oklahoma. At first most of the captives came from North Africa following the surrender of the Afrika Korps. After the Allies invaded France in 1944, the camps received an influx of soldiers captured in Europe. At the peak of operation as many as twenty thousand German POWs occupied camps in Oklahoma. Seven posts housed enlisted men, and officers lived in quarters at Pryor. At each camp, companies of U.S. Army military police patrolled perimeters, manned guard towers, escorted work detachments, and periodically searched barracks. Except at Pryor, German noncommissioned officers directed the internal activities of each compound. After the captives arrived, at least twenty-four branch camps, outposts to house temporary work parties from base camps, opened. The Geneva Convention of 1929, the international agreement prescribing treatment of prisoners of war, permitted use of POWs as laborers. Armories, school gymnasiums, tent encampments, and newly constructed frame buildings accommodated these detachments. Clothed in surplus military fatigues conspicuously stenciled with "PW," German soldiers picked row crops and cotton, harvested wheat and broom corn, manned the Santa Fe Railroad's ice plant at Waynoka, cut underbrush and timber in the basin of Lake Texoma, served as hospital orderlies, and worked on ranches. The prisoner of war program did not proceed without problems. Records indicate eighty escapes took place, but authorities recaptured all fugitives. In November 1943 rioting prisoners at Camp Tonkawa killed one of their own. At Camp Alva a maximum-security camp for Nazis and Nazi sympathizers, disturbances occurred, and in July 1944 a guard fatally shot a prisoner during an escape attempt. These incidents, combined with war wounds, injuries, suicide, or disease, took the lives of forty-six captives. Most POWs who died in Oklahoma were buried at the military cemetery at Fort Reno. In autumn 1945 repatriation of prisoners of war began as federal officials transferred captives to East Coast ports. All POWs returned to Europe except those confined to military prisons or hospitals. By mid-May 1946 the last prisoners left Oklahoma. Most of the land was returned to private ownership or public use. Few landmarks remain. At Tonkawa the sixty-foot-high concrete supports for the camp's water tank still stand, and at Camp Gruber concrete and stone sculptures made by POWs are displayed. William P. Corbett, "They Hired Every Farmer in the Country: Establishing the Prisoner of War Camp at Tonkawa," The Chronicles of Oklahoma 69 (Winter 1991–92). Arnold Krammer, Nazi Prisoners of War in America (Chelsea, Md. : Scarborough House, 1996). George G. Lewis and John Mewha, History of Prisoner of War Utilization by the United States Army, 1776–1945 (Washington, D.C.: Department of the Army, 1955). Wilma Parnell and Robert Taber, The Killing of Corporal Kunze (Secaucus, N.J.: Lyle Stuart, Inc., 1981). Danny Steelman, "German Prisoners of War in America: Oklahoma's Prisoner of War Operations During World War II," The Oklahoma State Historical Review 4 (Spring 1983). "Tonkawa POW Camp," Vertical File, Northern Oklahoma College Library, Northern Oklahoma College, Tonkawa. Richard S. Warner, "Barbed Wire and Nazilagers: PW Camps in Oklahoma," The Chronicles of Oklahoma 64 (Spring 1986). Terry Paul Wilson, "The Afrika Korps in Oklahoma: Fort Reno's Prisoner of War Compound," The Chronicles of Oklahoma 52 (Fall 1974). Bill Corbett, "Prisoner of War Camps," The Encyclopedia of Oklahoma History and Culture, https://www.okhistory.org/publications/enc/entry.php?entry=PR016.